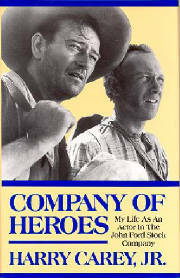 Copied text about Dobe's Book, "Company of Heroes", from his website: When Harry Carey, Sr. died in 1947, director John Ford cast Carey's 26 year old son, Harry, Jr. in the role of The Abilene Kid in "3 Godfathers". Ford and the elder Carey had filmed an earlier version of the story, and Ford dedicated the Technicolor remake to his memory. Company Of Heroes is the story of the making of this film, as well as the eight subsequent Ford classics. In it, Harry Carey, Jr. casts a remarkably observant eye on the process of filming Westerns by one of the true masters of the form. From She Wore A Yellow Ribbon and Wagon Master to The Searchers and Cheyenne Autumn, he shows the care, tedium, challenge, and exhilaration of movie-making at its highest level. He also gives us insightful and original portraits of the men and women who were part of Ford's vision of America: John Wayne, Richard Widmark, Henry Fonda, Maureen O'Hara, Ward Bond, Victor McLaglen, and Ben Johnson. classics. In it, Harry Carey, Jr. casts a remarkably observant eye on the process of filming Westerns by one of the true masters of the form. Click on this Text to go to Dobe's site.